Getting a heart pattern for different shaped cushions. Beginning to draw a heart pattern can seem a little daunting. Firstly the two sides of the heart have to look the same size and shape and if you are like me then I can possibly do one side but then the other side looks completely different. The one way you can make sure that both sides will look the same is to make half a heart shape first. Once you have this mastered, you can then trace the full shape using mirror images of the half shape. The most important part of this pattern is getting the curve shape at the top right. If you are not confident in your drawing then you can always trace around something. To get the curve at the top of the shape I have used a plate, then using the ruler I have drawn a straight line down to the corner of the paper. The depth of the "V" depends on how you want your cushion to look and this can be altered to your choice. Shown here is the start of the pattern and the finished drawn line. The hearts can be drawn smaller by using a smaller item to trace around. I have used a small plant pot saucer and ruler or a cookie cutter. I had to modify the top as the "V" was not defined enough. 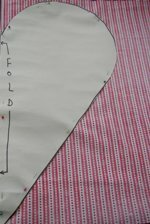 When I sewed it together the heart definition was not showing. 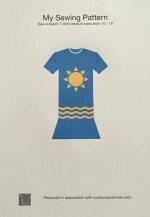 The pattern is now complete as this can now be cut out and the middle line placed on the fold of the material. 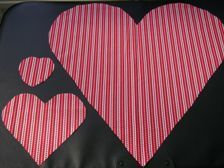 If you wanted a full heart shape, the pattern can be turned over and the middle matched up to get the full heart shape. 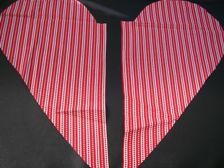 The front section of the pattern is the one that is placed on the fold of the material, or the full heart shape. 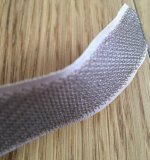 The back would have two pattern pieces as this is the place the fastenings would be inserted. 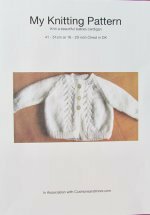 The pattern of the back would be done exactly the same as the front but extra seam allowance should be added to the middle to allow for the fastening to be sewn in place. The back pattern would not be placed on the fold of the material but would have two individual pieces cut out. Enjoy experimenting with ways to get your heart pattern drawn. Other shapes to try and make patterns for are round, square and rectangle to give lots of different shapes in your room.